Crossing the border into the Northern Territory was filled with mixed emotions. To say that we were all sad leaving Western Australia would be an understatement.We spent 6 months in WA and really only saw a snippet of what this fabulous state has to offer (see 'Cover Page' article). Unfortunately I think our sadness in fact overshadowed what should have been excitement of finally reaching the NT. It really does have 'The Wild West' feel about it and we are now excited about the next leg of our epic journey. Only 20 kms over the border is a small, low profile National Park called Keep River. Somehow Chris had heard of this little gem and was on her must see list. The 18 km of corrugated dirt road in off the highway was a little painful but the reward at the end made it very much worth while. The camping ground was nice with a limited number of sites available, complete with pit toilets, fire rings and tables. The whole area was, to state Harry- very 'Bungley'. And bungley it was. This place is a very well kept secret that the Ranger herself admitted was in no way promoted or advertised. You could very easily think that you were in the Bungle Bungles as the surrounding geography was almost the same be it on a slightly smaller scale. There are a number of walks all of which we did including the 8 km circuit. It was a fairly tough walk, especially in the heat of the day but very enjoyable. One of the walks took you to an Aboriginal rock art site. This was the most impressive, extensive and best preserved aboriginal art that we have yet seen. The information said that most of this art was believed to be over 5,000 years old. That's hard to get your head around! We were very impressed with our introduction to the NT and hope there is more of this impressive landscape ahead. 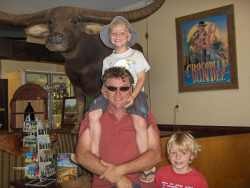 As it was a 500 km drive to Katherine and beyond, we had an overnighter at Victoria River Roadhouse to break the trip. This place is yet another example of a roadhouse providing a great service to the traveling public - clean amenities, lots of green grass and reasonable fees. And what happens when you provide good service for a good price, the place is busy of course. How could such a simple concept be overlooked by so many other business owners??? On our way we stopped in Katherine, did some shopping, fueled up and had our gas bottle filled at the cheapest place in Australia. $15-00 to fill a 9 kilo bottle is sensational. We have paid up to $33-00 in other places for the same thing. Katherine looks like a really nice town and we will spend a bit of time there on the way back down. 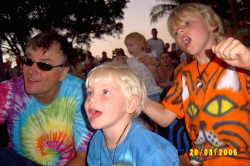 Ross and Dulce Trulson's son, Mitch now lives in Katherine and we are looking forward to catching up with him. He works at 'Tindal Air force Base' and is arranging for us to do a tour of the base. The kids (all 3 of us) are very excited about that. Edith Falls camp ground is a very flash National Parks run establishment, really well laid out, with all the sites surrounding a dozen or so areas of green grass, most with free gas barbies. Flushing toilets and hot showers took away a little of the bush camping feel, but boy a hot shower is great. 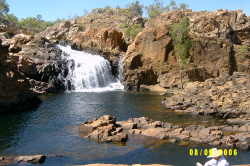 Only 100 metres from our site was the lovely Edith falls and pool. The next day after a lazy start (which they all seem to be lately) we set off on the 3 km trek to the top of the falls and to the upper pool. Great swimming spot and very spectacular scenery. This certainly is a place you could veg out in for 3-4 days but we best press on. There is so much to see in this area. It looks like it will be a bit like WA, and we will need a year to see it all. On our way to Douglas Hot Springs we pulled into Pine Creek to, of all things, empty the toilet, and who should we bump into but the Joiners (there is something ironic in that). We thought we had got rid of them 2 weeks ago!!! 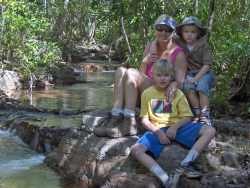 They are on their way back home now, having completed the Darwin- Kakadu circuit. After a quick cuppa we then milked them of any useful information before heading off in opposite directions.We're pretty sure we have got rid of them now!!! The camp ground at the springs is a huge open grassy area with plenty of shady trees. We set up and went down to see what these hot springs are really like. Verdict- Bloody hot. In fact 60 degrees C hot. It really is amazing and a little hard to describe but I shall try. The hot water bubbles out of the ground, in places bubbling up like a water fountain. It then flows down stream in it's own very hot creek until it meets with the main river which consists of very cold water. The secret is to sit in the area where the two waters blend. This sounds easier than it actually is as it seems to change constantly. One second you are cooking, then freezing. Or worse your front is boiling while your rear freezes. It is a very pretty setting with the only down side being the background smell of sulphur. I mistakingly thought Chris had just let one go!! Could also have accounted for all the bubbles! I'm still not sure. Butterfly Gorge is another spot we really wanted to see while out here, but unfortunately the road was closed. Further investigation revealed that it has been closed since last December but should be open soon. This particular Gorge is usually only open for a few months each year. We knew that the Rangers had been doing a final sweep in search of saltwater crocs before opening it so we remained hopeful. The fact that this area has had the best rain for the past 25 years made us even more excited to see it at it's best. The next morning, after successfully repairing another caravanner's fridge (could be a new business here) we set off to see the local caravan park, 'the arches' and some more thermal pools. Just before we left the campground we saw the Rangers, complete with boat driving past. We thought they must have been going into Butterfly Gorge for one last check. When we drove past the entrance, the gate was open. We assumed they had gone in and omitted to close the gate behind them so in we went. The road was in a terrible mess with numerous water crossings, trees down over the road, huge gouges and long, extremely muddy bog holes. Because we thought the Ranger had gone through in front of us we had no fear about getting stuck as they would eventually be coming back out should we need assistance, so through we went. Wrong. When we finally got to the end , no rangers to be seen. Lucky for us, the highly skilled and very talented driver (or maybe good old fashioned luck) got us through safely. The car that I had spent hours washing in Kununurra again was covered in mud and completely filthy. Chris likes it dirty!!. She says it looks like a prissy city car otherwise. She is becoming a bit of a bushy I think. We were happy to get in there and see something that so few actually get to experience. Last year it was open for less than 2 months. On our way back to the campsite we followed in two Kedron caravans who decided to park near us. I noticed they had a 'Ron Glass Marine' sticker on their tinnie. And who should get out of the car but George and Carol Christensen from Bundaberg. We had a good long chat and caught up on the old times before they moved on the next morning. You would have to ask yourself what is the chance of being this far from home in such a remote location and see someone you know. Even if they parked 100 metres away from us we may have never seen them. Amazing. It's a 'small world' strikes yet again. Just before we set off I went back down to the thermal pools for a bit of video footage. It was a very eerie sight. 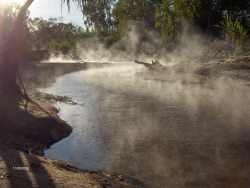 To see all the steam rising from the near boiling water into the cool morning air was like something out of Jurasic Park. At any minute I expected to see a dinosaur make it's way across the landscape. Next stop, very close to Darwin and apparently extremely busy- Litchfield National Park. Our journey today took us through a very quaint little place that most of us have probably never heard of. During WWII while Darwin was getting bombed, the military moved most of it's infrastructure and command to this very small backwater, Adelaide River, situated a few hundred km south of Darwin. This was thought to be a much safer site than Darwin. Situated in this small town is one of the country's largest war cemeteries. This beautifully manicured area on the outskirts of town was a very solumn reminder of the devastation and senseless loss of young lives produced by war. Not only Australians but also Canadians and British are buried here alongside 63 civilians killed in the Darwin bombings. The average age of the dead would have been in their early 20's. While walking around Harry was asking a million questions about the place, and trying his hardest to understand it all. After explaining it to him as tactfully as we could, he looked up at me and asked, "Why couldn't they just leave all these people alone so they could be happy?". From the mouths of babes. It was impossible to leave this resting place without tears in your eyes and a longing for people to learn from our disasterous past. I only wish. The other reason this town is well known is because of the local drinking hole, that not only has the best 'barra and chips' in the NT but also 'Charlie' the buffalo from Crocodile Dundee I & II, now stuffed and standing proudly on the bar. 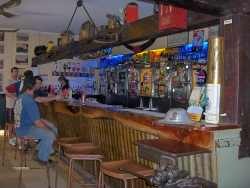 The Adelaide River Inn is one of those must visit places. Bar stools made from horseshoes and memorabilia made it an extremely interesting place to sit and take in a bit of the wild west. Oh, and by the way the barra and chips alone is worth the effort. 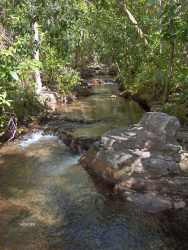 Litchfield National Park covers 146 square kms and is 115kms south of Darwin. It encloses much of the Tabletop Range, which is a wide sandstone plateau surrounded by cliffs. On the road into the campground you have a spectacular view, straight down the middle of the road in front of you of Wangi Falls. It is a very imposing sight and a nice welcome mat to this pretty part of Australia. 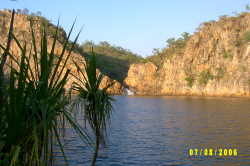 The pond at the bottom of Wangi Falls is a very popular swimming spot with tourists. Swimming anywhere up this way except in a swimming pool is a little unnerving due to the saltwater crocs. We had a chat to the Ranger the other day about the crocs. There is currently over 75,000 salty's in the NT and there should only be around 10,000. The reason for the explosion in numbers is because the Indigenous people are no longer eating the eggs and killing the crocs for food in the same numbers as they previously did, and also because the crocs are now protected. They are currently trying to pass some legislation to commence culling. Now for the part that made me a little nervous. 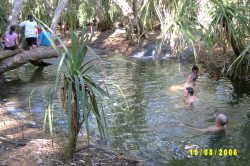 The water hole at Wangi Falls that everyone swims in is 'monitored' daily for salty's. That seems to involve two strategies. The first are traps set slightly downstream containing a dead chook. Not sure what their hit rate is but they do catch them. Not long ago they trapped a 4.1 metre salty. The second strategy is to scour the swimming hole with a search light each night looking for their beady eyes and then trying to determine if it is a freshy or a salty. Doesn't sound overly scientific to me, but hey what would I know. So my third strategy is whenever swimming I make sure there is another tourist in front of me that I can shove in the crocs mouth, should one appear. It's every man for himself out here, let me tell you. Now I did mention that this place was busy, very, very busy. The fact that it is so close to Darwin is it's downfall. There is coach after coach all full of tourists descending on this place every day. Of course that doesn't detract from the natural beauty but does mean you need to share it. I think that for the next few months that is something we will have to get used to. While we were here we did most of the walks and swam in every safe??? swimming hole that the area has to offer. One very interesting place we visited was the Blythe Homestead built in 1928. This was actually an outpost to the main homestead that was 25 miles away. The Sargents had 14 children and the older kids (down to the 10 year old) were sent to live in the outpost to mine tin. They were out of bed before sun up and worked until dark. After working all day they then attended to all the other chores like growing the veges, cooking the meals and doing other domestic duties. Every so often their father would make the 25 mile journey and bring in supplies and check on his children. And they call them the 'good old days'. I don't think so. On the way to the Homestead we did our deepest water crossing yet with the water nearly half way up the doors of the car. We are going to look at getting a snorkel put on the car in Darwin so we can tackle some of the over the bonnet crossings in Kakadu. Bring 'em on!! Whatever happened to our pure, white immaculately clean Nissan. You should see it now. We visited the 'Lost City' which are some amazing rock formations, that with a little imagination look like an old tumbling down city. Actually looked more like something out of the 'Flinstones'. Was that Barney I saw behind that rock?? 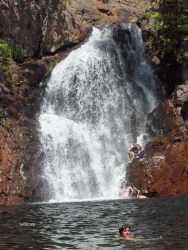 We also went to Florence Falls which we think are the most spectacular we have seen in Litchfield. The swimming hole was clear, cool and safe. Next stop was 'Buley Rockhole'. This was sensational. Pure spring water leeching straight out of the mountain, flowing rapidly downstream into numerous pool size ponds, some shallow and some extremely deep. 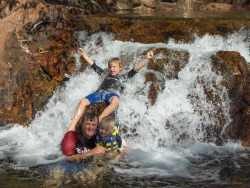 As far as swimming holes go this is a definite highlight of this area. Our next stop will be Darwin. Phone reception at last. Darwin, a melting pot of cultures, markets and food. A city with a population of only 100,000 people and nearly as many shopping centres. This is a place that is attractive from the minute you drive in. Green and tropical with beautifully maintained gardens, medium strips and roundabouts. This city has more sporting facilities than the rest of Australia put together. For such a small population, Darwin is a really big place. It is very well laid out, and even I found my way around. The entire city is built around many beautiful beaches and secluded bays. The climate in the dry is almost perfect. Pleasantly warm days, cool nights and constant clear skies. A gentle breeze seems to blow 24/7, making life very nice indeed. In all we spent 2 weeks here. The first week was spent at Lee Point Caravan Park and then for the second week we moved slightly closer to town to Koa Caravan Park. Both these parks and one more are owned by the same guy and you will not find a mention of these parks anywhere, not even the white pages of the phone book. His only advertising is 'word of mouth'. All his parks are full because he offers a great service at a great price. An ensuite site for $22.80 a night for a family of 4. Can you believe it, they don't charge for kids. Can this guy be cloned??? Tony and Gail have been in Koa for a few months and it was really good to catch up with them again. Plenty of laughs were had by all. They will be back on the road again soon so hopefully we will see them again. Let me assure you that Darwin would be a good holiday destination and I am kicking myself that I didn't know that before. There is a mountain of things to see and do and most are free. In the 2 weeks we were here we hardly had time to draw breath, the main reason being the markets. If you have been to Darwin and visited all the markets you will understand what I am on about, if you haven't, you will think I am exaggerating. We have been to a lot of markets in our time, but nothing like these. Mindil Markets are the grand daddy of them all. Twice weekly (Thursday nights are the big ones with Sunday night a close second) this event takes place during the dry season. Set on the beautiful Mindil beach in a large parkland this is a huge collection of international foods and market stalls. It opens around 4-00pm and goes until late. The food is hot, fresh, cheap and plentiful, the street entertainment endless and the market stalls sell everything from stuffed cane toads to opals. Then there are the Parap Markets on Saturday, and the Nightcliffe and Rapid Creek markets on Sunday. 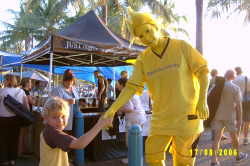 Then if you are keen you can head off to Palmerston for a few more. All the markets have food, food and more food, (the freezer is full of curries - yum!! ), fresh Asian herbs, spices, fruit and vegetables, as well as the usual craft, clothing and jewellery stalls. I thought Chris's eyes were going to pop out of her head. Sticking to the same optical slant, these markets were real eye openers. Sorry about that !!! We would have to say that the markets themselves are worth coming to Darwin for. So what else did we get up to during our stay? One of the things that is very obvious as you walk around the wharf and city is the impact that WWII had on Darwin. There are a number of plaques and information boards around the city and a big display at the museum. Maybe I was asleep during history lessons at school, or more likely it was never taught, but both Chris and myself were unaware exactly what transpired up this way during 1942. How many of you are aware that more bombs were dropped on Darwin than on Pearl Harbour?? Well over 600 people were killed in Darwin alone, including some civilians. The city wharf, Government house and a lot of town was destroyed. The Military at that stage moved its command post to Adelaide River and everybody except for essential personnel were evacuated from Darwin. Around the time of the War there were a large number of huge aviation fuel storage tanks at the wharf. As you could imagine they were prime targets for the Japanese and were destroyed in the first raid. These were quickly rebuilt at the same spot and you guessed it, bombed again. Apparently they were rebuilt and consequently bombed a number more times before they decided a more secure storage facility was needed. As all the young men were overseas fighting they recruited 300 blokes, all aged in their 50's and 60's to dig out 6 huge tunnels in the side of the hill near the city. They were given almost no equipment for the job, so with pick and shovel off they went. Nearly two years later this engineering masterpiece was finished. Each tunnel was 171 metres long, 5 metres high and could hold 3.8475 million litres of fuel. The day the tunnels were handed over to the military for use was the day the war ended. These tanks never had fuel put in them and have never been used for anything. They are now a great tourist attraction and one that displays that great Aussie spirit of getting in and getting the job done, regardless of the obstacles. 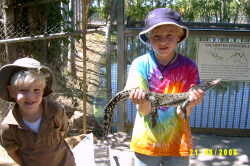 You can't come to the far north without going to one of the many crocodile parks. We went with the popular choice, Crocodylus. In this establishment they give a home to the big bad crocs that are caught from the wild, they do a lot of research and farm crocs as well for their meat and skin. 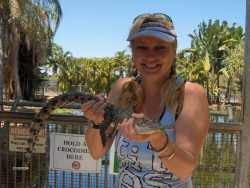 It is in fact more like a zoo with lots of other exotic animals, many of which we have never seen. But let's face it, we are here to see the crocs, big crocs. They have set this place up really well. They have 20 breeding pens, all containing a big male and female, for obvious reasons. These pens are back to back with two rows of ten pens each and across the top is a walkway which allows you to look down into the pens. The water in the pens is dirty but not very deep, about waist deep at the deepest. Five times a day this skinny little bloke named Ruben gives a great educational talk on crocs and then jumps in the pens with the crocs and starts belting the water with an aluminium pole. His objective is to get one of these 4 -5 metre giants weighing 500 kg to jump out of the water at him. He goes to great lengths to ensure that you fully understand these are intelligent, ruthless and powerful killing machines. He then explains how you will be slowly ripped apart, remaining conscious for the 20 minutes it takes on average for croc victims to die. It would appear his role is to educate and to put the fear of god in you, which he successfully did. As he said, with the increasing number and size of the salties in the NT, more and more people are going to die. Now the part that really made us stand up and take notice was that on this walkway we were looking straight down (only about 5 foot down) into about knee deep water. We knew there was a croc in that water but it was impossible to see it. We couldn't even see a ripple in the water. Next thing these giants launched themselves out of the water straight at silly Ruben, with such speed we all screamed, with one person dropping their camera on the crocs head. These guys can leave the water at 35 km/hour and if you are within 5 metres of the water's edge you are history. They can also jump their entire body length out of the water. They have even been known to jump into boats and some attack outboard motors, biting off the props, while they are at it. Nothing, except for a bigger croc seems to phase them. The motto of the story up this way is you don't swim in anything unless it is tiled and has a filter. Good advice I think. We visited the museum, which is extremely good, went to the old Fanny Bay Jail, did a tour of Parliament House, went to a game of football, went a couple of times to the free water park and visited all the beautiful beaches that this city is built around. 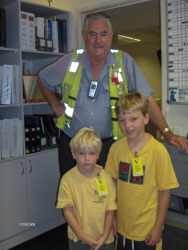 Without a doubt one of the highlights was being lucky enough to meet a guy in the caravan park where we were staying who is the 'Safety Officer 'at the Darwin International Airport. As it was my birthday he offered to take us all on a tour of the airport. We got to see the main security room with all the computer screens for the surveillance cameras. We had a chance to operate the cameras, panning around and zooming in on different areas of the airport. We then all jumped in the 'Safety vehicle' and drove all around the airport including driving straight down the middle of the Darwin's main runway, all 3600 metres of it. A number of times the control tower radioed us to 'vacate' the runway while planes either took off or landed, then back on we went. Darwin airport is shared between the military and civilian aircraft so he even took us over to the Airforce side to see some military planes up close. 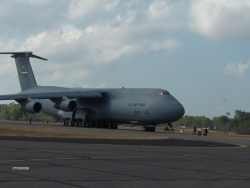 We sat very close and watched a US Airforce DC-Galaxy, one of the largest planes to land in Darwin, take off. Now that was up close and personal, not to mention noisy. It was a great experience for us all and not something that many people get to do. Alex thinks he would be the only kid at school to drive down the middle of an 'International Airport Runway'. I think he could be right. These special events are what we will all remember forever. These are the things that money can't buy. It's all about being at the right place at the right time and meeting the right people. Seems to happen a lot on the road. Every day over the last week it has been getting gradually hotter. We also noticed that most afternoons the cloud started to build up, but no rain. As you may be aware they only have 2 seasons this far north, the wet and the dry. It is probably more accurate to say they in fact have 3 seasons, the latter being the build up. From September to late November it becomes hotter and hotter with a daily build up of threatening clouds, but rarely rains. The build up is what the locals don't like. Hot and cloudy but no rain to cool it down and clear the air. Once the wet starts the almost daily afternoon storms are a welcome sight. So that is it for Darwin, a great destination and we would imagine a great place to live. Add it to the evergrowing list of places you must visit. I keep saying it but that's another month gone. Time certainly doesn't fly this fast at home when in the same old boring routine. It's been another excellent month, great weather and not a drop of rain. 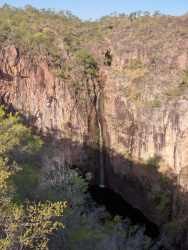 The Northern Territory really is the last frontier, so unspoilt, so natural. You don't notice how incredibly busy and commercialised the East coast is until you get away from it for a while. Car and caravan going well, although the bike rack we borrowed off Priestley did snap, with the bikes on it and put a big scratch down the back of the car. Thanks Rosco! Interesting to note that in the 9 months we have been away not one of us has been sick in any way, not even a runny nose. Is it because we have no stress and dramas to weaken our immune system, or don't bugs live this far north? I think it must be the lack of stress because as well as not being sick, I have almost stopped taking the tablets for gastric reflux that I have been on for years. The main cause of gastric reflux is worry, curry & worry. I'm still eating the curries, but have no worries. It is surprising the stress that everyday life puts upon us, regardless of 'how in control' we think we are. We have now travelled 26,163 kms, have spent $6,800 on diesel and $5,800 on accommodation, both of which are well under budget. Our average fuel economy for the total trip is 18.8 litres/100km or 5.3 km/litre. We have only had 2 flat tyres, both on the van and I was able to plug both and then have them internally patched at the next town. One little splurge we had was buying a 'Wireless broadband card' for the laptop. What that means is as long as we have CDMA phone reception we have access to the internet, without having to rely on internet cafes, which though reasonably cheap, are a little inconvenient. We wished we had bought this at the beginning of the trip and would recommend one if you intend to travel. Well guys, we are now off to Kakadu and beyond. Hope you are all well and working hard. Somebody has to keep the country going. Stayed tuned for September updates. Life is a process of becoming, a combination of states we have to go through. Where people fail is that they wish to elect a state and remain in it. An easy trap to fall into, but one that can be avoided.